The Home Decorators Collection Tuscan Stone Bronze Laminate Flooring offers an ultra-realistic stone finish that mimics the surface textures and characteristics of a real stone floor. With a natural look and hues of bronze, copper and browns, this well-crafted floor is ideal for active households and includes the patented Embossed in Register surface texture that precisely positions over the pattern underneath. Premium features include an attached underlayment that saves time and money in addition to reducing noise, extra-large boards to speed up installation and an easy-to-install glueless locking system. Each tongue and groove is fully sealed to help prevent moisture penetration, and the patented Joint Guard technology protects joints from chipping. Home Decorators Collection floors are also GREENGUARD certified for low-emitting products, providing an environmentally friendly solution for your flooring needs. 20.02 sq. ft. per case; case quantity: 4; case weight: 30.10 lb. 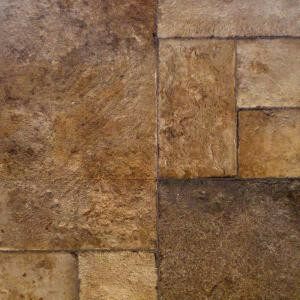 Buy online Home Decorators Collection Tuscan Stone Bronze 8 mm Thick x 16 in. Wide x 47-1/2 in. Length Click Lock Laminate Flooring (20.02 sq. ft. / case) 934063, leave review and share Your friends.